This 3.8 mile section of the Appalachian Trail runs straight up and down (or so it feels) the northeast side of Moosilauke. 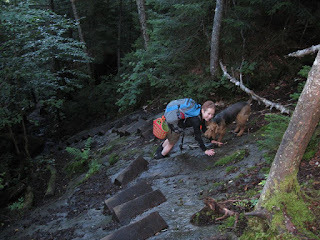 The extremely steep bits are right next to waterfalls and the brook, so the rocks/slabs are usually wet and a fall could mean a negative outcome. There are iron hand/foot rungs and wooden steps in the more "interesting" spots (courtesy of the Dartmouth Outing Club). Elevation gain: 3100 feet.